Sine Mora is a old school style side scrolling shoot em up or shmup Co-developed by Grasshopper Manufacture and Digital Reality published by Microsoft Studios for the Xbox Live Arcade. The game presents a diesel-punk setting where you get to pilot aircraft through a number of colourful stages, shooting everything in your path. There’s an underlying story here which is told via text and foreign speech between rounds, as well as a bit of banter thrown in during missions. There are a total of seven distinct looking stages which take you through caverns, underwater, into a sprawling city and much more. What’s neat about Sine Mora is its accessibility; rather than toss you in at the deep end, the shooting starts off pretty simple, and with a tutorial mission on hand to guide you, it’s an easy ride until the difficulty ramps up and your piloting/shooting skills get truly tested. What is remarkable about the gameplay is the use of a speed up boost which effectively speeds up your craft by slowing things down around you. This is a must have attribute that’s effortlessly worked into the design of the game. When the screen becomes filled with enemy lasers for example, holding the right trigger slows down time (determined by a blue meter which can be refilled by collecting orbs) allowing you to plot a course through the madness with relative ease. There is a penalty of course and that is you lose any multiplier you may have built up as a result. There are more gameplay quirks on offer as well, because rather than present a traditional system of a life bar or shields, the game’s determining factor is time itself. With each hit you receive, chunks of time are shaved off the ever present timer, and if it reaches zero then you die. Alternatively, you gain additional time by completing sections and so balances out nicely. As already mentioned, there are various orbs to collect as you shoot up enemies, which range from adding additional time to the clock, a temporary shield, extra score, refill slow time gauge, secondary weapon ammo and primary weapon power ups. The power up orbs are the most interesting, because when you get hit, your collected orbs release into the air which have to be collected before they disappear. It makes for an extra layer of madness to an already tense and tight game. With the game’s simplistic approach, the graphics are not to be scoffed at, as there as some fine environments and stages to travel through. There’s some dull interiors, but these are offset by some colourful outside stages filled with lots of fine details to marvel at. The enemy designs are also pretty spectacular, included the mini bosses and main boss characters which often fill most of the screen. What’s pretty neat is how the camera pans around showing off your craft as it circles these gargantuan forms, adding a real sense of scale to proceedings. Sine More is a great looking game. 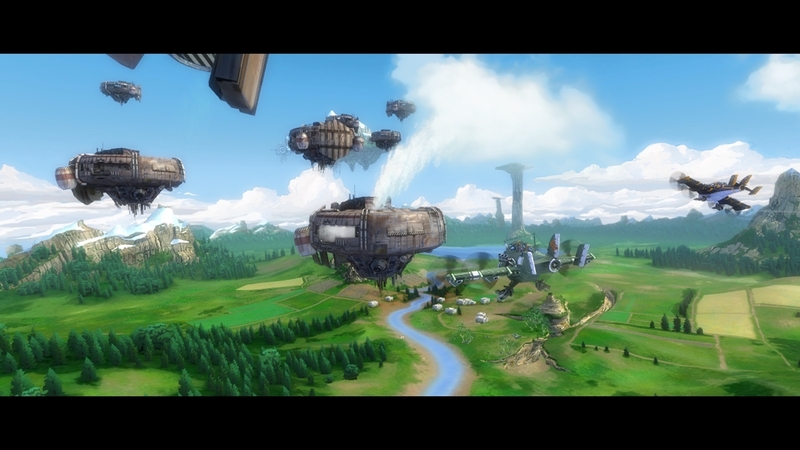 Sine Mora is also 3D enabled for those gamers with 3D TVs. There’s some slight degradation of clarity of image in 3D mode, but generally the game comes alive with some great looking depth, a little bit of pop out effects, making for really cool showcase game for 3D owners. With little lateral movement, this type of game makes for perfect fodder for 3D without the headaches or eye strain. The audio is also pretty solid too, offering electronica style beats and ambient sounds throughout the mass carnage. With composer, Akira Yamaoka (acclaimed for his works on Shadows of the Damned and the Silent Hill series) at the helm, there are some high production values on offer in this gem of a game. In terms of game length, the main story might take a few attempts, and to really build on the power ups, it’s always best to start from the opening rather than selecting later stages if you run out of continues and want to carry on. Depending on your skill, the seven levels won’t take long to beat, but then again, this is a shoot em up not an RPG where high scores are where it counts. To add a bit of longevity to the experience, there are alternate difficulties as well as an arcade mode which allows you to pick stages, craft and pilots for a more customizable game. If you want to face off against the bosses to practice, then there’s even a boss mode featuring all the bosses you’ve previously beaten. With a leaderboard for story and arcade modes on offer as well, there’s enough challenge on offer despite the relative brevity of the main game. Sine Mora is an unexpected surprise to hit the Xbox Live Arcade. It harks back to the old school, but with its modern looks is well up there with some of the best looking games on the XBLA. The gameplay is challenging, immersive a wee bit frustrating at times, but that comes with the territory. If you’re looking for something that’s a bit different, has loads of character, and will test your gaming skills, then this is well worth the investment. Sine Mora comes highly recommended for anyone calling themselves a gamer.